You never know what you'll find while surfing the web. Many of us learned last fall that NMA member Leo Leary had suffered a serious stroke. A few days ago Bob Marquart ran into him at a Norfolk Tides baseball game. Leo was puttering around on a three-wheeled scooter, as Bob says, "about 60 pounds lighter and just lookin' good." Bob adds that Leo still has some arm and leg issues, but he's "bouncing back strong." He's been on a few cruises with his wife and is now back to work full time at his bar, Dockers. Leo attributes his recovery to obeying a strict therapy regimen. On behalf of all who know and love him, may I say that it's good to see Lieutenant Leary finally doing what he's told. Every Navy Musicians Association reunion builds a stronger sense of friendship. In Memphis we wrote down each others' email addresses on NMA notepads and cocktail napkins, brought them home and updated our address books and mailing lists. Email is a great tool for keeping camaraderie alive. Email is also a great tool for spreading racism and religious bigotry. Since the reunion some shipmates have started sending me jokes about encouraging Muslims to commit suicide, pickaninny jokes about a black presidential candidate and other such crap. The NMA--like the USA--is white, black, conservative, liberal, Christian, Jew and None of the Above. Yet we in the NMA are blessed with something special and unifying, a history of service and a common bond of experience that draws us together. Please, my shipmates, do not weaken that bond with bigotry and bias. Hate is corrosive, and rust can sink a ship. It's a free country and you can send messages of division to whomever you want. But let me be clear: when you send such demeaning trash to me, you only demean yourself. Please don't send me bigoted garbage. I don't want it. My old shipmates from the 7th Fleet Band will remember this party. The USS Blue Ridge joined ships of navies from around the world in the visit to Sydney, Australia, for the 75th Birthday Celebration of the Royal Australian Navy. You'll see the manning of the rails and the doffing of covers while "hip-hip-hooraying" Prince Phillip during the massive nautical Pass in Review. The XO of the Blue Ridge made a training video of this maneuver that was broadcast endlessly continuously over the ship's closed-circuit TV station. The crew finally had the dialogue memorized and would greet each other in passageways saying, "Remove your cover and wave it in a clockwise motion," "Try to show some enthusiasm," and "Now, let's look at that from another angle." I've updated the ever-popular Navy Musicians Lexicon. If you haven't been there in a while click here and refresh your vocabulary. Four sailors stand on the deck arguing about the merits of their ratings. "We hull technicians keep us afloat," says the first. "Quartermasters get us where we're going," says the second. As the disbursing clerk and electrician's mate join the fray, the ship hits an iceberg, sinks, and all hands are lost. In seconds, the four sailors find themselves standing on a cloud before the Pearly Gates. "What's the problem?" St. Peter asks the unruly group. "We can't agree on which Navy rating is the most important," answers the hull technician. "That doesn't matter here," says St. Peter. "All are equally treasured in heaven." The sailors grumble for a moment. The quartermaster finally says, "We're not coming in until we find out which is the most important rating." The Navy's mission depends on the effective integration of all its ratings. While some may require more rigorous training and hold its members to higher standards than others, all ratings are honored in heaven. Accept this and enjoy your eternal reward. I once asked my bandmaster why he'd stopped rehearsing a certain piece. The showband had been working on it for days, but progress had slowed. "You have to know when to stop," Chief Warrant Officer Waldron said. "Eventually, you hit the point of diminishing returns." Like so many of Tex's teachings, this one was a lifesaver when I became a bandleader. The time comes when you have to put music aside, imperfect, unfinished, and move on to the next piece. John Branam had abundant opportunity to face this challenge during the reunion. As the new rehearsal director for the Navy Musicians Association reunion, John faced the built-in conundrum of this unique position: the NMA rehearsal director can't spend much time rehearsing. We've got hundreds of charts to play through. One will obviously never sound right, no matter how much work we put into it. Another lays well the first time through and needs no further polishing. A third is fun to read but sounds like hell. A fourth would be great if we just had time to woodshed our parts. So many charts, so little time. We've got a dance coming up on Saturday. We just want to play together for the enjoyment. We also want to develop our ensemble sound. "Could we take five? I gotta make a head call." The pianist hasn't shown up yet. The second alto doesn't have page two of "Don't Get Around Much Anymore. "Hey, man, can't we just read through this one more time? "Put that one away and get up #179, "Girl Talk." At the beginning of June, visits to Navy Lyres amounted to 5 or 6 visits per day. I was happy with this small readership, considering how little work I put into keeping the site going. 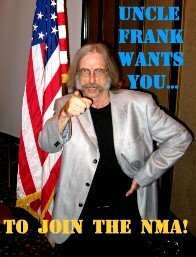 Then, as I saw the Navy Musicians Association reunion approaching, I improved my product and promoted it. Improvement was simple: I provided frequent updates. Websites need fresh content like bands need new arrangements. Promotion was more difficult. I contacted former MUs with functional email addresses and told them about my plans to "live-blog" the NMA reunion. In a few days, Navy Lyres got 15 visits in one day and I was astounded. Then word of mouth kicked in--NMA members told their friends and I began to hear from former MUs who haven't yet joined our organization. The day before the reunion started Navy Lyres had 41 visits. Activity grew through the week: the last day of the reunion brought 68 visits. Yesterday was the high point, with 76 visits, and that single-digit daily average has grown to 66. If this rate stays steady, I'll have 2 billion visits per day by the middle of next week. That won't happen of course. The reason for yesterday's spike is simple: members have returned home from Memphis and are turning on their computers to check on the reunion coverage. I'm not going to strain too many muscles patting myself on the back. Compared to YouTube, this site is a flyspeck. I'd be happy to hang on to even half of the current traffic as the year goes by. But this has shown me the power of promotion. And promotion is exactly what it takes to grow an organization such as ours. It doesn't take a website or technical Internet knowledge. All it takes is an occasional phone call to an old friend. That's how Terry Chesson sucked me in a few years ago. We already have a tremendous product in the Navy Musicians Association. As this year goes by, let's remember to promote it to those who haven't yet joined.